Healio brings you the highlights from Vision Expo West. Refer back to this page often for the latest news from VEW, perspectives and interviews with leading researchers and clinicians, and to review archives of past meetings. 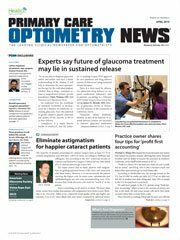 Primary Care Optometry News is co-sponsoring the Ocular Surface Disease and Wellness Symposium, to be held September 16 during Vision Expo West. The course takes place 1:30-6 p.m. and is pending 3 hours COPE approval. Speakers include Jack Schaeffer, OD; Scot Morris, OD; and PCON Editorial Board member Marc Bloomenstein, OD. Location: Sands Expo & Convention Center; Las Vegas, Nev.